The ADIB Value+ Card​ has the best and the most flexible rewards program to best suit your needs! Purchase your ticket using your ADIB Value+ Card. 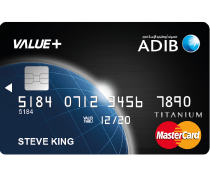 ​ADIB Online Banking – visit adib.ae to view and transact on your ADIB Visa Platinum Rewards Card. Enjoy dining, shopping, sports activities, travel benefits and other unique collection of experiences especially designed for you!